Day of the Undead 2010: 4th UK Festival of Zombie Culture. years, with a celebration of Zombie Films, Book and Games from around the World. Square and is being held on November 13th, 2010 and tickets are available now. 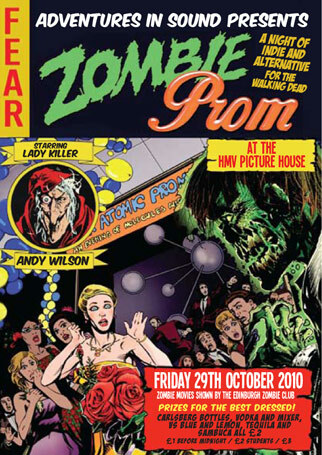 Friends of the Zombie Club, The Edinburgh B-Team, have organised another special night. I’ll hand over to Adam from the B-Team. Ticket prices are £2 available from the Jekyll & Hyde now or £3 on the door. All timings are approximate. It’s going to be a great night and we look forward to seeing you all there. Bloody hell but that sounds good! So there you go folks, I hope to see a lot of the EZC regulars there. Fancy being a zombie in a book trailer? Well, you can! On the 13th and 14th of August we will be filming a book trailer for Remy Porter’s zombie novel Dead Beat and we need extras. No experience required just enthusiasm. There are a number of shots over the weekend and we’d be happy to hear from anyone who is interested in taking part. Take a look at the five different scenes being shot and decide which ones you’d like to take part in. You’re not limited to just one you can take part in any or all. Want to know more? Head on over to the website and tell them that we sent you. The all-dayer is sold out! 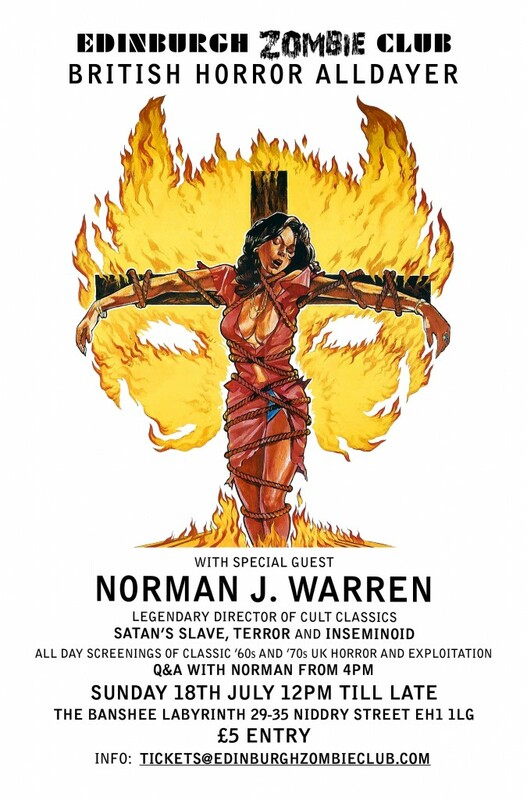 The Norman J. Warren event is now sold out! Thanks to everyone who has bought tickets, if you’ve paid over PayPal then they’ll be on the door for you on Sunday. Based on a MR James short short, Night Of The Demon is a bona fide classic atmospheric horror film. A curse place spewed forth by an executed witch wreaks havoc among the descendants of her killers in 1970s London, who meet their ends in a variety of graphically brutal ways. Infamous for it’s death by celluloid scene, this giallo inspired shocker is generally regarded as one of the director’s best. Overshadowed by the director’s better known Hammer & Amicus output, this is a lost gem of black comedy. After spending nearly twenty years in jail for a series of cannibalistic murders, Dorothy Yates and her husband Edmund, who was jailed for his attempted cover-up of his wife’s ghoulish tastes, are apparently cured and released back into society. Their two daughters are haunted by the fiendish deeds of their ghastly parents, and soon the killings begin again. But is it Dorothy this time, or someone else? A tale of Home Counties cannibalism often compared to The Texas Chainsaw Massacre. The Duc de Richeleau and his friend Rex discover their young charge Simon has fallen in with the powers of Darkness and is about to be baptized into the service of evil. The Duc is fortunately versed in such matters and finds himself locked in a duel with the deadly Mocata, disciple of the left-hand path. What better way to end the day as we approach the witching hour with this classic slice of Satansplotation? 1981’s Just Before Dawn is one of the best tales of wilderness horror out there. It’s one of the finest-made slashers of the 80’s and it easily blows movies like The Final Terror, Don’t Go in the Woods, or The Prey out of the water. A group of young adults come to check out the mountain property that one of the group has just bought. However they are not alone in the wild. A hulking in-bred murderer, who seems to be in two places at once, is lurking and apparently hates trespassers. Director Lieberman, who gave us such great B films as Squirm (1976) and Blue Sunshine (1977), does an excellent job with this smart thriller as well. The movie is nicely atmospheric, with a creeping sense of tension and some strong suspense. This film makes even the open wilderness seem frighteningly claustrophobic. The Oregon locations are beautiful and well captured by the crafty cinematography. The music score is a true original and awesome in contrast with the scenic visuals. Deborah Benson makes for a great lead, her presence was captivating. Gregg Henry delivers a good performance as Benson’s lover and Chris Lemon provides some occasional charisma. The supporting cast, especially veteran actor Kennedy, also does quite well. An anthropology professer takes his class into the woods to seek the legendary Bigfoot, and boy, do they find him! This is one pissed off mystery primate, who proceeds to off a succession of campers in a variety of gruesome ways. Not to be confused with the classic 1950s British film with the same name, this is possibly THE greatest killer Bigfoot film ever made, delivering on what The Legend Of Boggy Creek II promised on its cover but failed to deliver on celluoid. Banned in the UK on its inital release, crammed full of all the usual EZC staples; bad acting, over the top gore and a truly bizarre plot twist, plus a creature costume that would shame 1970s Doctor Who. This film will make you scared to pee in the woods ever again. This will also be EZC’s second birthday, so I dare say some of us will be hanging back for a drink after the films to celebrate, so feel free to join us. Don’t forget to get your tickets for the all day event as well. As the poster says, just email tickets@edinburghzombieclub.com to book yourself a place. Our friends in trash, the Edinburgh B-Team, have an exciting upcoming event!